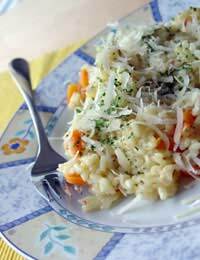 The rich rewards to be gained from a well constructed risotto are not difficult to attain. Assemble some basic kitchen equipment, follow some simple rules and it is very difficult to go wrong. Let's start with the equipment. The starring role in this particular drama should be reserved for a large skillet, or wide shallow pan with as heavy a bottom as possible to promote even and sympathetic heat distribution during the cooking process. In plain English, you don't want the risotto to burn! For the stock, a medium sized saucepan will do, preferably with a lid so that the liquid reaches boiling point as quickly as possible and retains its heat as the stock waits its turn to be added to the rice. Finally, a wooden spoon for providing a very occasional stir, the material being important because metal would be more likely to damage the grains of rice, and a ladle for transferring the stock into the skillet. First boil up 1.5 litres of chicken or vegetable stock in the saucepan. The next stage is known as the soffritto, which consists of any combination of vegetables such as onion, garlic, carrot and celery, finely chopped. The fat for sautéing the soffritto can be butter, olive oil or vegetable oil or, indeed, a combination of butter and one of the oils which will prevent the butter burning. The garlic should be added after any of the other elements of the soffritto have softened in the skillet because it, too, will burn if left too long in the pan. Throughout the cooking process keep the skillet on a gentle heat. Add 450 grams of shortgrain rice to the sautéed vegetables and move the grains around to coat them in the oil. Add a dash of white wine and gently stir for around 30 seconds to allow the alcohol to evaporate. Next add one or two ladles of the stock, which will begin to be absorbed by the rice. Each time the liquid content begins to disappear, replenish with further stock. After about 20 minutes, taste the rice to check whether it has required the right consistency and bite on the tooth. If a little more cooking is required, simply add a little more stock. To prevent sticking, it is acceptable to stir the risotto once or twice but don't overdo it, otherwise the spoon will damage the grains, releasing too much of the starch and leaving you with stodgy risotto. When the risotto is ready, add a generous amount of parmesan cheese, adjust the seasoning levels to taste, and if a creamier consistency is required add a knob or two of butter, or some mascarpone cheese. The above procedure should be utilised as a template upon which further layers of flavour can be added. If you are using meat in the risotto, colour it in the pan following the soffritto stage but before you add the rice. If using seafood, then fish stock rather than the vegetable, beef or chicken variety is advised. But whatever combination you decide on, stick to the basic rules and you'll get great results every time.